You are here: Home / Uncategorized / Should I Seal my Asphalt Driveway? Should I Seal my Asphalt Driveway? 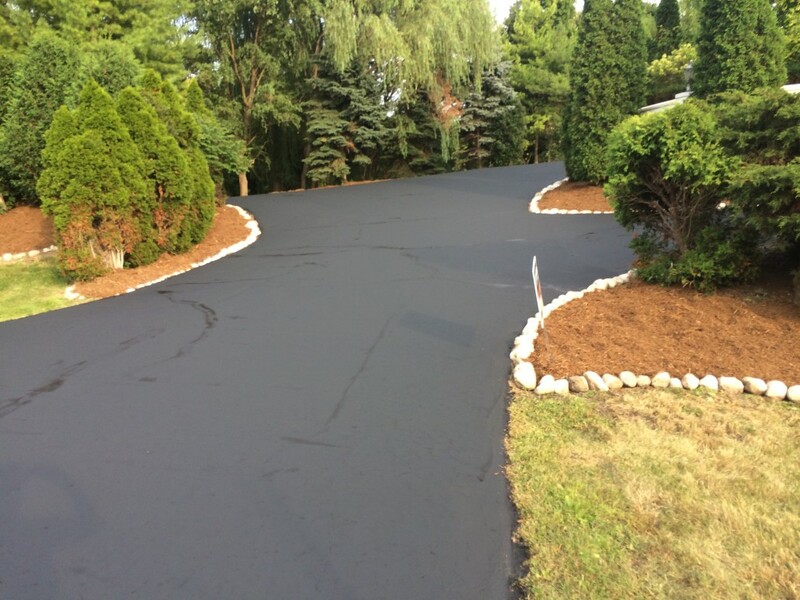 The best way to prolong the life of your asphalt driveway is by sealcoating. Sealcoating minimizes cracking, provides protection from the elements and enhances visual appearance. Asphalt driveways crack and discolor over time. This happens due to age, weather wear, traffic, etc. The damage process is faster with unsealed driveways. Once cracked or damaged, water from rain or snow fall will seep into the base and cause more damage. This can cause larger cracks or alligator cracks. It is sped up by the freeze and thaw cycle of the Midwest. Sealing your driveway provides protection from this by sealing the pores of the porous material. By closing those pores, water is not able to penetrate as quickly. The main benefit is the added protection that prolongs the life of your asphalt. It can prevent early replacement being necessary. Sealing your driveway can also enhance the appearance. It reduces fading and can make it look brand new again for a longer time. Sealing your driveway also allows for easier upkeep. You can clean oil or leaks from your vehicles much easier because the pores are sealed. What kind of sealant do you use? Yes there are different kinds with different benefits and/or downsides. How do you spread the sealer? Will you repair existing cracks before applying the sealer? With larger cracks it is important to start with crack filling before sealing. When can you start my sealcoating project? Armored Sealcoating will be happy to answer any questions you have. We also apply 2 coats EVERY TIME, even on residential seal coating projects. Our number one goal is to extend the life of your asphalt to the fullest. Quality is never underrated. Contact Armored Sealcoating for your free asphalt sealcoating estimate today. My brother has an asphalt driveway and has been wondering how he should best keep it looking good. You mentioned that sealcoating not only enhances the appearance but prolongs the life of your asphalt. My brother would be much more inclined to hire a professional service to sealcoat his driveway if he knew that it could prolong it’s life. Replacing an entire driveway would be very expensive compared to an easy upkeep. Thanks for the advice. I am really impressed with the picture that is used to illustrate asphalt. Now that I think about it, my best bud has a seal coated driveway! It is always super smooth to drive on and I don’t think they’ve had to do much to maintain it for a couple of years now. Fantastiv write up, we deal with freezing issues all the time here in central PA. You did a great job explaining how sealing the driveway fills in the pores, most people don’t realize that’s exactly how you keep water and chemicals out, just seal it up! In your article, you stated that sealing your driveway provides protection from this by sealing the pores of the porous material and by closing those pores, water is not able to penetrate as quickly. When I came home from work today I noticed that there were some cracks and rough spots on our driveway. I wonder if there are any community regulations that dictate what repairs can be done. Thank you for all this great information about choosing a Sealcoating contractor! One thing that really stood out to me is that you say that it can actually make the asphalt look brand new! It would be nice to know that you will be able to keep everything looking good and intact. I’m glad you mentioned how sealcoating can add protection that will prolong the life of your asphalt and that it requires the correct materials and methods. Hiring a professional contractor who will have the right skills and equipment to take care of it could ensure that it will last longer. When you’re hiring a contractor, you’d probably want to research the options in your area and then meet with your top choices so that you can talk to them about their services to ensure that they’ll be able to properly care for your asphalt. My wife and I have been wanting to find a sealcoating company who could help us with our driveway. I’m glad that you talked about hiring a sealcoating company and how it is much better than trying to do it on your own. My friends tried to do their sealcoating on their own, and I think that being able to hire a professional company would be much better! Thanks for the tips! It is awesome that you mentioned how to choose a sealcoating contractor since this is the first time I have thought about hiring someone to coat my asphalt driveway. You talked about how you should questions about sealant and which way the contractor will spread the sealer. I had no idea that there were different way to spread sealer and that it was possible to cut corners and create sealing puddles. Thanks for the help. That’s nice that sealcoating can help your driveway last. A driveway is an investment, so it’s important to take care of it. Sealcoating protects your driveway from water, which can weather your asphalt. Thanks for mentioning that sealcoating the driveway can prevent damages so you don’t have to replace it. I just had my driveway paved, and I don’t want to have to do it for a while. Maybe I should have it sealed so I won’t have to worry about replacement for a long time. I appreciate you mentioning how seal coating your asphalt can help it last longer. It is important to remember that understanding how seal coating works can help you find the best way to protect your floor investment and have it look great and durable. We are planning on paving our driveway and a friend mentioned how we needed to seal it, so I’m glad I found your post. I was not aware of the benefits in sealing your asphalt. I like how sealing your driveway can enhance its appearance and make it look brand new again. I’ll keep this in mind, should we decide to change our driveway to asphalt. Thanks for sharing! My husband and I just got an asphalt driveway and we both really want to take care of it. Our friend suggested that we get a sealcoating to help protect it. I didn’t know that sealcoating helps minimizes cracking and provides protection from the elements. That sounds like it would be a really great thing to have. The longer we can keep this driveway looking great the better. Thank you for all the information! Thank you for explaining the importance of seal coating your driveway. One thing that I liked that you said was that seal coating can not only make your driveway look better, but it will help protect it from cracks. With the winter coming, my wife and I want to fix our driveway so that we do not have to worry about it cracking even more. Thanks again! My parents were talking to me about getting some driveway sealing, which I think would be really helpful. I’m glad you talked about being able to hire a sealcoating contractor, which I think would be better than trying to do it on my own. I’m going to have to try to get some good driveway sealing done, and take care of any problems we might have! Thanks for the information about hiring a sealcoating contractor. I like that you say to ask about the application and the type of sealant they use. Then I can be sure that I will end up with a finish that will last as long as possible. Does this have any effect on the surrounding asphalt? I want to know just so I don’t damage it even more. I have been thinking about doing it by myself, but I am not quite sure how. Thanks for explaining this. I think I’ll start my search for a contractor right now! If you are going to invest in paving you should do all you can to get the most out of it. You mention that sealcoating can add years to the lifespan. When we build our custom home this year we will remember this. I agree that it important you have your driveway sealed by a professional. I think that this kind of obvious, but clearly people ignore the advice. I would for sure use a professional to seal my driveway. Pleasant Prairie Seal Coating Job Well Done!